It’s a perfect day to make buko melon salad since its in season, it’s cheap and you can see them everywhere. They are commonly prepared as a shake, ice cream, salad desserts or eaten on its own, as a fruit dessert. A very simple and light salad dessert to serve at a feast. 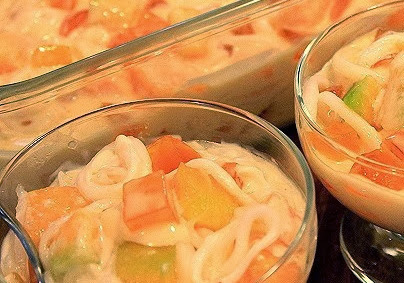 Another Filipino tropical salad dessert to enjoy this Christmas. 1. Drain nata de coco well and set aside. 2. Wash, peel and dice the melon and drain the excess juice same with the young coconut shred should be drained as well, reserving some coconut juice then set aside. 3. Heat condensed milk and cream in a pan on a low heat and stir to mix well let bring to simmer. Dissolve cornstarch in reserve coconut juice and add into your cream mixture. Simmer over low heat until it thickens and forms a ribbon when you lift the spoon. Let it cool completely, stir occasionally to cool down and to avoid the cream from scorching. 4. In a big salad bowl combine diced melons, coconut strips and nata de coco and toss in cooled dressing. Chill for at least 4 hours before serving. 5. Serve in dessert glass and top with a scoop of vanilla or melon ice cream and enjoy!